On this page I put together a collection of momentum problems to help you understand momentum better. The required equations and background reading to solve these problems is given on the momentum pages on the dynamics page. When two billiard balls collide the collision is assumed to be elastic. 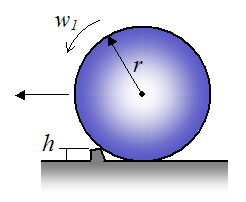 Show that for a general case, where the collision is not head on, the cue ball moves in a direction perpendicular to the direction of the object ball, after impact. Assume that the balls have the same mass and the object ball is initially at rest. A solid ball of mass m and radius r is rolling without slipping on a flat horizontal surface, at an initial angular velocity w1. It hits a small bump of height h. What is the angular velocity of the ball immediately after impact? Also, what is the minimum initial angular velocity w1 so that the ball just makes it over the bump? What is the minimum initial speed of the ball? Assume that the ball pivots about the tip of the bump during, and after impact. 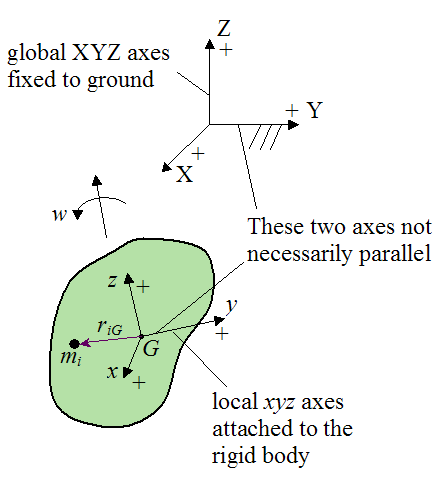 In the angular momentum page we showed how the angular momentum equations for a rigid body are derived. The figure below shows the set up used for the derivation. where m is the mass of the rigid body, Σ represents summation over all the particles in the rigid body, and HG is the angular momentum of the rigid body about point G, as given by equation (6) on the angular momentum page. The above equation can be very useful when solving certain momentum problems, as shown in the next problem. See the problem, Cat righting reflex. This is an excellent real-world example to aid your understanding of conservation of momentum problems. 1. Can a person be "blown away" by a bullet? I created a physics analysis for these three problems, in PDF format. It's available through this link.